Any thoughts? It's the same whether I select D: (hard disk) or F: (external). 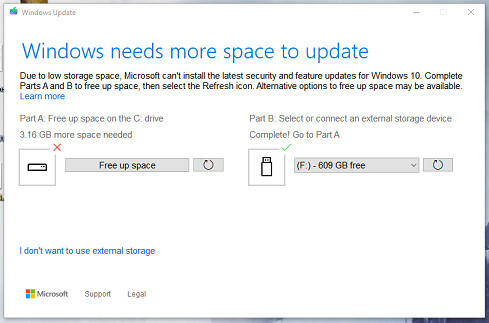 It wants free space on the "C" drive where the OS is installed. You either have a too small "C" drive (or partition) or you need to move something to one of the other drives. Thanks, Jack. I eventually realised that I had a large quantity of photos sitting on my desktop, which of course lives on the C: drive. The file explorer properties feature only seems to add up files, not folders, so it took me a while to spot. Anyway, all sorted now. 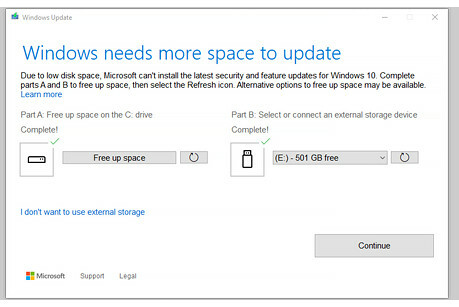 But why do they offer the use of an external drive when the update needs to work in the C: drive anyway? Doesn't make sense.